The Kopari Coconut Multitasking Kit ($38; sephora.com) is a neat little kit with four of Kopari’s coconut Oil based skin/body/haircare. The kit comes with a mini Coconut Melt, which is a nice multitasker - coconut oil sustainability sourced from the Philippine Islands. The size is just right and it has a multitude of uses from removing makeup to healing dry, chapped skin and as a frizz tamer when used sparingly. The Coconut Balm is a dry skin balm that looks more like a gel, only a tad less thick. While I do think this is a nice balm, I do find it a little less moisturizing for my dry skin, so maybe a nice one if you don't have very dry skin. The Coconut Body Glow is a sheer, shimmery gel that works as a body oil to add a bit of sheen. The shimmer can get a tad too much, so be sure to go light handed. It also has a strong scent, something to keep in mind if you have a sensitive nose. The Coconut Sheer Oil is a dry oil for the face and hair. Its a super lightweight oil-serum that sinks in quickly and hydrates really well. All of these products do tend to solidify a little at colder temperatures, because of the coconut oil. 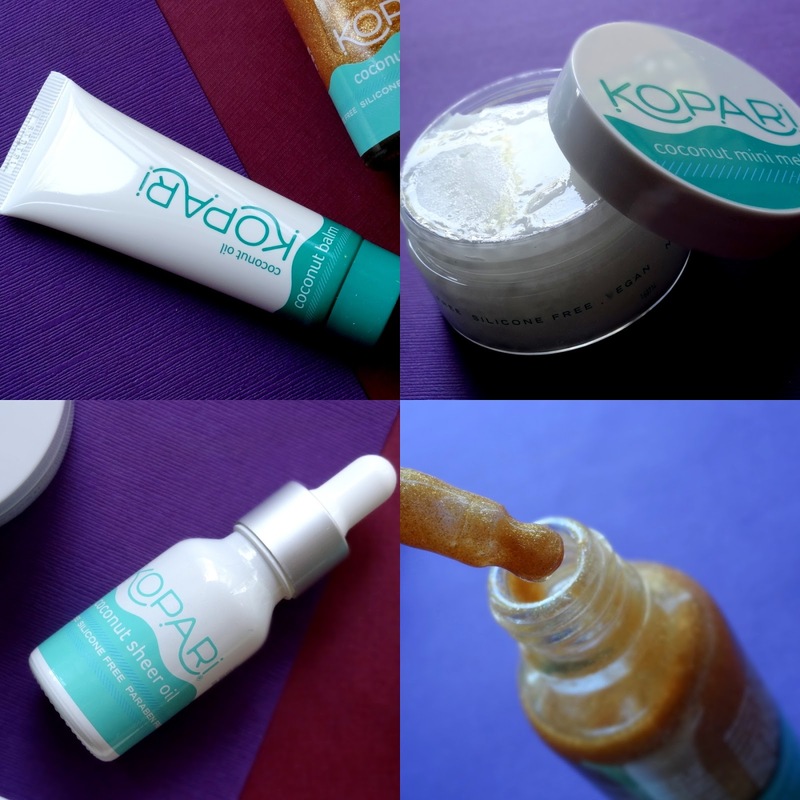 Its a nice little kit that makes for a good gift and a nice way to try out Kopari Beauty. The sizes are quite nice too - travel size, but not too tiny. My favorites are the Coconut Melt and the Coconut Sheer Oil.